It's likely there has never been a motion picture as anticipated on a global scale as Star Wars: The Force Awakens, except perhaps The Phantom Menace in 1999. Ever since 2012 when George Lucas sold the rights to his gigantic property and Disney along with Kathleen Kennedy took over, the excitement levels for what was to come were off the charts. It goes back much further than 2012, though. From the moment "Directed by Richard Marquand" splashed across the screen at the end of Return of the Jedi in 1983, fans have wanted to know what happened next. Try as they might, no amount of universe expansion in the form of books or video games could fill that gap the original trilogy left at its conclusion. Let's not even discuss the actual, Star Wars films that have dropped in the last 30 years. Instead, let's get right into, shall we? The Force Awakens is the best Star Wars film in 30 years. I know that's not exactly shocking news to hear. It would have been a nightmare knocking on Disney's door if early word about The Force Awakens was that it was as bad as – or, God help us – worse than George Lucas' prequels. But it's also not a surprise to learn this latest adventure doesn't instantly sink into our hearts the way those original films have been able to given the amount of time they've had to accomplish that very thing. That's an expectation that couldn't possibly be met no matter how great a film is. The task set before J.J. Abrams, who directs and co-writes here along with screenwriters Lawrence Kasdan and Michael Arndt, was to find a balance between the built-in nostalgia and the new story to be told. Let's be honest. The nostalgia was always going to be there. It's in the grin that spreads across your face every time you see the words "A long time ago in a galaxy far, far away…" It's in those feelings of excitement every time you hear familiar sound effects: the blips and whistles of a Droid, the sound of a Tie Fighter flying by, and even Chewbacca's roar. All of these are required window dressing that immediately whets a fans appetite for more of the same. Sure, just that would have been enough. Where Abrams and crew take the narrative, though, is what makes The Force Awakens more than just pretty fan service that will only appease the die-hards. It's a new story with new characters set 30 years after the events of the previous film. The Empire has slithered into hiding in the shadows of the galaxy, slowly rebuilding itself under the name The First Order. The Rebel Alliance, now known as The Resistance, still fights the enemies of peace and tranquility in the universe. It becomes a crisis of conscious for one Stormtrooper, Finn (John Boyega), who chooses the middle ground after seeing the nefarious actions of his group. The normal, day-to-day lives of various inhabitants of the galaxy, though, only hear tales and rumors of the heroes, villains, and repercussions of that great war that once shaped their world. It's in one of those everyday lives, a scavenger named Rey (Daisy Ridley), around which Abrams chooses to build this new story. Like a young, unassuming, farm boy who finds himself caught up in the war for his galaxy, Rey inadvertently finds herself in the battle between The First Order and The Resistance. Once again there's a small Droid carrying vital information which the villains are trying to obtain. Rey and Finn fine one another through happenstance, the obligatory team slowly building. Again the enemies have a mass of starships, Stormtrooper soldiers – still with terrible aim – and even an ultimate weapon with the capability of destroying entire planets. 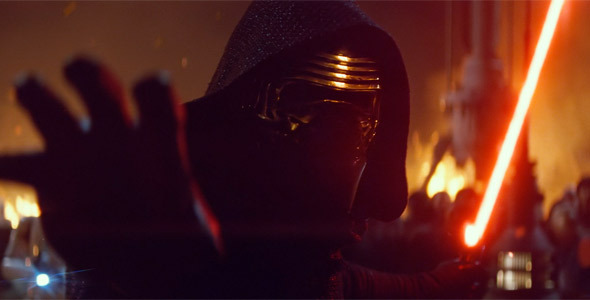 Even Kylo Ren (Adam Driver), The First Order's mysterious enforcer who wields a red lightsaber and the power of The Force, is something of a callback to the Darth Vader of old. There are a number of times The Force Awakens is a reminder of a A New Hope in ways that are general as well as specific. The screenplay doesn't shy from the nostalgia but, instead, embraces it. Even this isn't simply for the sake of fan service, though. Abrams and his team find a way to make everything important to the story at hand. That goes much further than Han Solo (Harrison Ford) and Leia Organa (Carrie Fisher) playing integral parts in this story. The story we're given is one built around the mythological magnitude of these characters as well as Luke Skywalker (Mark Hamill) and the Jedi. This allows the new characters to have something of a nostalgia for this world, as well. The mysteries that are set up in The Force Awakens are ones built on the natural progression of the Star Wars universe. Other than the opening crawl - which says a ton with just its opening line - there isn't much exposition to be had about the way this world has changed. Information is at times given to the audience at the precise moment it's given to a character. Some surprises which might have normally been an episode-ending shocker are casually dropped in conversational dialogue. All the reveals and characters, though, serve to build this new world in which Star Wars fans find themselves. Fortunately this new world seems to be in solid hands, at least with this first, new entry, and that goes for the action as well as the story in which the former inhabits. As he has done a number of times before, Abrams keeps the energy at a unflinching high. The screen is never filled with as many odd creatures or magnificent spaceships as it was with the CG-laden prequels. Every aspect of this new Star Wars universe feels organic, lived-in. The battles, space and terrain-based, are more grounded than they've ever been. The characters within those battles are more natural and realistic than anything in this franchise in decades. Much of the credit goes to the exceptional batch of actors filling the lead roles this time. Boyega and Ridley deliver performances that are both unique and reflective of the place in which the character finds his or herself. As Finn, Boyega shows a natural fear of going against The First Order, a group in which he is well informed, but his arc allows the young actor to let moments of heroic force slip through. Ridley, on the other hand, projects immediate strength in her character. Rey's fear comes in the lack of awareness she has about every aspect in her world. That includes personal information, the only knowledge she has of herself coming from a fleeting memory from when she was very young. Ridley is forced into more range than her co-lead, and she nails every, suitable emotion with as much subtlety as she does strength. Adam Driver creates a memorable foe in Kylo Ren, and it's often accomplished with little more than his voice. Ford and Fisher naturally slide back into the roles that made them worldwide superstars nearly 40 years ago, as does Hamill with much less screen time here than his former co-leads. Oscar Isaac as a brash pilot for The Resistance, Domhnall Gleeson as a First Order general, and Andy Serkis as the mysterious but powerful leader of The First Order all give remarkable performances that leave us itching for more. This feeling goes well beyond the acting performances, as well. 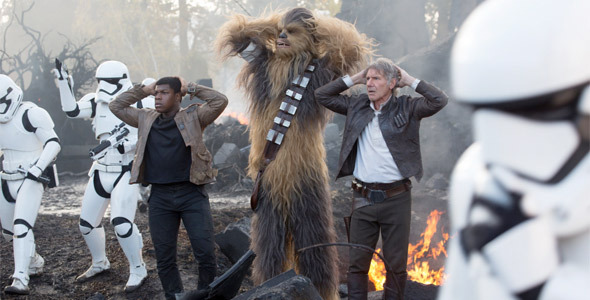 Every aspect in The Force Awakens leaves you yearning for more. Yes, that includes a revisit of this very movie again, as any work of cinema with this much anticipation will naturally require multiple views. It will probably take two or three viewings just to overcome the nostalgic sense of joy that naturally occurs in the experience. That yearning includes the immediate desire to carry on with the story, as well. The patience required to endure this time until Episodes VIII and IX are released is a new feeling for those who grew up in a world where A New Hope, The Empire Strikes Back, and Return of the Jedi were always readily available. Patient we must be, though, but it's made easier knowing the Star Wars universe is back in our lives and in the hands of those who know how to make us feel young again. Have fun Ari! Let us know what you think of it! 6/10 I'd still prefer watching the OT. The best star wars movie ever! But not the best movie of the year. It's a awesome ride and the casting of Daisy Ridley and Adam driver is excellent. Boyega did disappoint me, but overall is was a funny and exciting movie and with a big surprise in it wich is the highlight in the movie. JJ abrahams did a splendid job! Thanks for your appreciated opinion! Glad you enjoyed it! I will try to find some time to go to a cinema near my holiday spot (Drenthe) the next few days. Nice. I'm taking an extra long lunch on Friday to see it in IMAX. Glad I'm reading positive reviews today. It was way better than expected. Nostalgia moments favours the older fans, but the new part of the cast is friggin sparkling. People pre bad lipping Boyega based on the trailer was corrected so thoroughly they will hate him more just because of it. Thank you, thank you Abrams. I always thought he looked like he's going to do a good job, based on the trailers - although the trailers seemed to always show him out of breath for one reason or another. Yeah Boyega did good.. pity about many of the other aspects of the film..
And I can't wait to give them my money. Multiple times. You really need to learn how commas work, dude. YES. IT IS HERE, PEOPLE. I will not be see this, even being as big of a Star Wars fan I am. Disney throwing away over 30 years of expanded universe to make a quick buck is a slap in the face of any true fan. Star Wars was one of the last things I knew of that had no stupid alternate reality/timeline. It was a complete universe, full of many tales and characters still to be told of. It really sickens me that this is the state of things now, not just with Star Wars, but all of entertainment/media. Nothing is considered sacred anymore, people only look to make more money as soon as possible now a days, whether it be prequel, sequel, or even completely redoing something that was already made. It's as if not one thought was given to the fans, authors, artists. Only the dollar signs that could be made. And so goes something that has been apart of me for a long time. I suppose the directors, actors, producers, and anyone else associated with this won't be fazed at all as long as they get their money. Just the thoughts of a (past) Star Wars fan. Why are all the ratings on the low end? Our trusty official reviewers say it's a masterpiece for the ages. Where is the disconnect? it's realy that good if you are a Star Wars fan!